For project-based firms, measuring current firm performance is the most significant indicator of future firm performance. Furthermore, by using trend data, firms can forecast cost and schedule variances in the early stage of a project. A preferred method by project managers to factor this trend data is the earned value management technique. 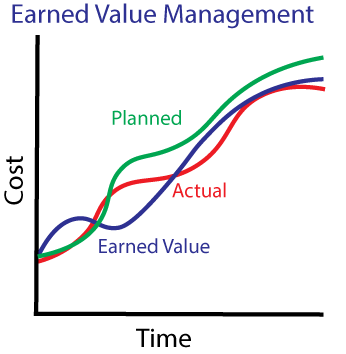 Earned value management allows firms to evaluate cost and schedule variances in both dollars and percentages on projects. These factors are derived by considering planned value, actual cost and earned value over time. Keep in mind, there are a number of other scenarios that can also explain these factors as well. Getting the information above is actually simple. It requires holding project managers to a high level of accountability. Project managers need to evaluate the amount of hours budgeted, hours burned (JTD), and the effort required to finish the scope of work (ETC). As a result, this will produce the financial percent complete. Project managers then need to record where the project is from a physical percent complete, which should tie to progress on the project schedule. Much like a crossover episode of two TV shows, this is where EVM crosses over with a previous blog about FASB 606. EVM will ultimately meet the requirements that in turn will keep the accounting team compliant with FASB 606. By maintaining a project plan in the Resource Planning module, firms can be successful in developing a project report that shows cost and schedule variances in both the dollars and percent (CV, SV, CPI and SPI). If your firm has a benchmark or standard range, you can then compare the actual to that standard to identify anomalies in your projects performance. Learn more about Michael Kessler and his more than 30 years of experience of working in and around project-based accounting here.